Papua New Guinea is one of the last frontiers of adventure travel, providing an unparalleled array of natural beauty, exotic wildlife and cultural tradition. 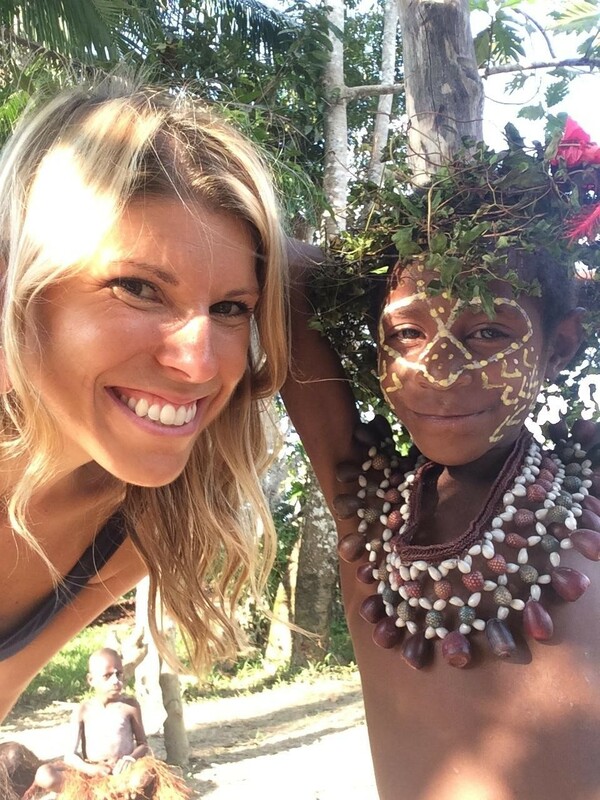 Join Kelley Ferro, travel expert and video journalist, as she journey’s through Papua New Guinea with USTOA tour operator Swain Destinations to discover the vibrant collection of cultural possibilities found within this truly unique destination. 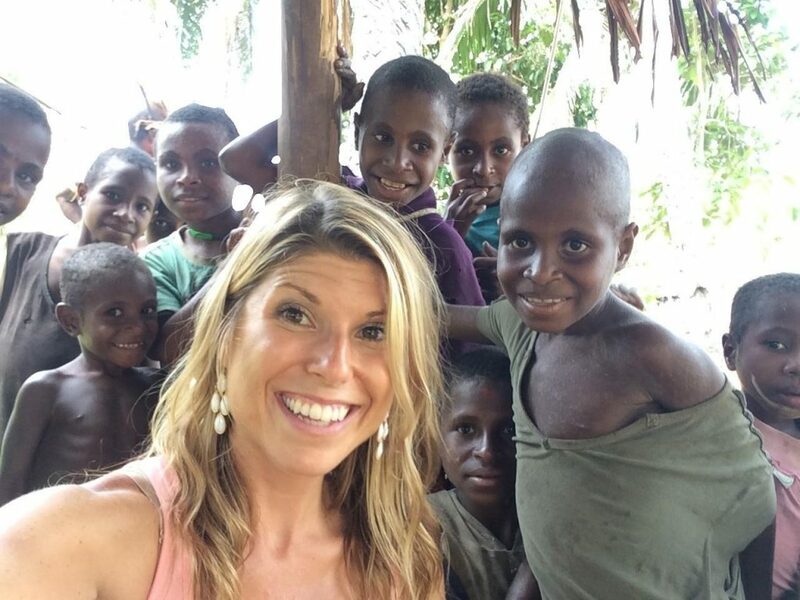 Travel expert and video journalist Kelley Ferro starts her customized journey of Papua New Guinea in the Highlands. Swain Destinations gives Kelley an insider look at Highland life from a visit to the bustling Mt. Hagen Market located in one of Papua New Guinea’s largest cities, to learning the fascinating cultures, traditions and beliefs of the Huli people. Papua New Guinea may not be known as a foodie destination, but travel videographer Kelley Ferro found each meal on her journey to be fresh, local and satisfying. On each customized itinerary, USTOA tour operator member Swain Destinations provides an education on what the locals eat in each region from farm to table. Watch as travel videographer Kelley Ferro is immersed into the local Papua New Guinea food culture. 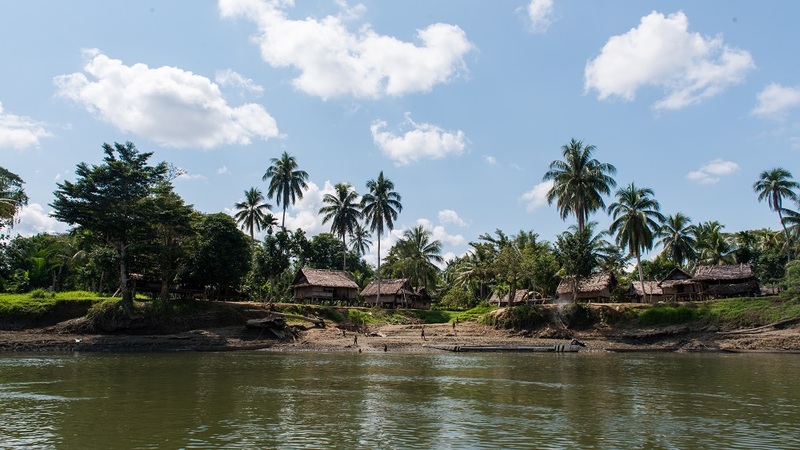 USTOA tour operator member Swain Destinations arranged for travel expert Kelley Ferro to stay at environmentally friendly lodges in each point of her customized tour of Papua New Guinea. 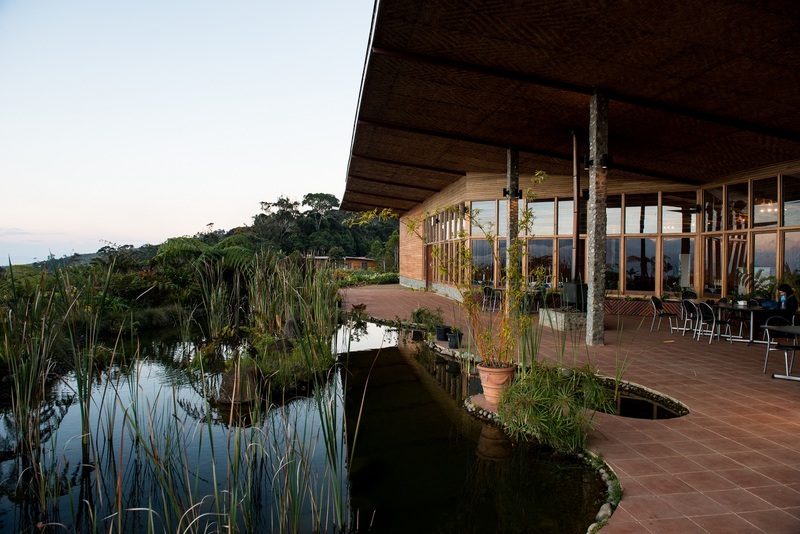 Join Kelley for an insider look at the three breathtaking lodges featured in her itinerary, each one embodying the spirit of its location within this breathtaking destination. 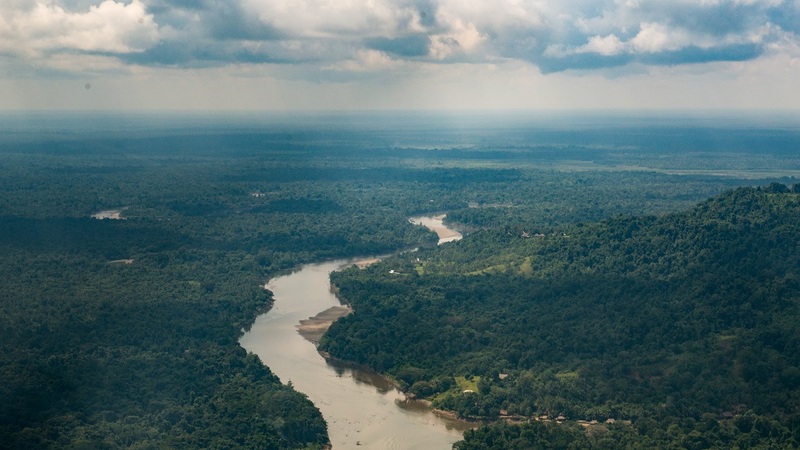 Travel expert, video journalist and contributor to Tripfilms.com, Kelley Ferro, jumps on a private charter plane to explore the expansive tropical lowland rainforest region of Papua New Guinea. 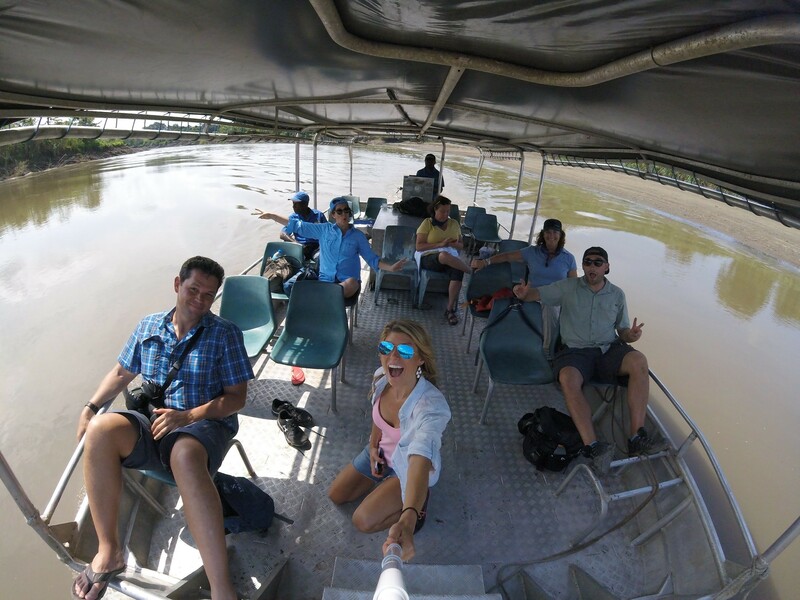 Join Kelley on her customized tour with Swain Destinations as she travels by riverboat to meet locals and explore villages along the Karawari River, as well as discover the local wildlife of the lowland region. Everything changes for the traveler when he’s afforded an opportunity to become an active participant in his own getaway. Walking through museums, touring (but not touching – never touching!) sites of historic importance, or zipping around on a bus, boat, or car while the landscape whizzes past at 65mph: each is well and good in its own way and enjoyable from time to time, but nothing can replace the sensation one feels when engaging a local on their own turf, and at their own game. For me, this is how experience comes to life, and this is how I most feel connected to a place, a space, and people. The Karawari River, seen from on high. I felt very much alive while standing on a fallen tree out in the middle of the Karawari River, a hundred miles removed from nowhere. A cadre of local Papua New Guinean kids had caught the attention of our Swain Destinations crew while we enjoyed our riverboat lunch, and encouraged us to join them for swim. Without really thinking about what might be lurking in the water, we went for a dip. We had spent the morning visiting villages in the Arambak region, notorious the world over as the site of ancient crocodile scarification rituals, headhunters, and cannibalism. But none of that had me as a scared as that unsteady branch dangling ten feet above the river. Still, I was afraid of looking like a punk in front of the kids (and my Swain cohorts) than the water, so I took a deep breath and dove in. I popped up downriver to the unabashed cheers of my new friends, and before I knew it, I was up on that branch and ready for another death-defying bit of acrobatics. 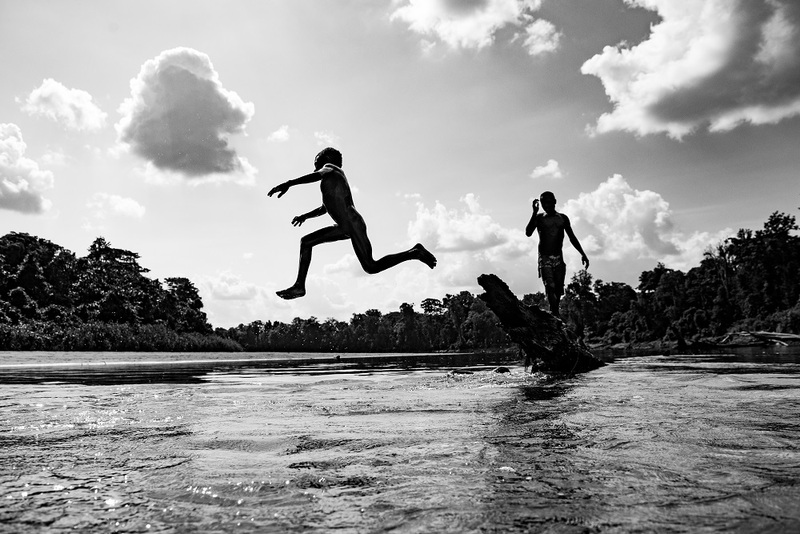 I suppose that one brief moment out on the river represented my time in Papua New Guinea in miniature – excited to be present, unsure of my footing, but eager to dive in just the same. Hanging out with local kids on the river, and ready to jump into new experiences. I think that’s how you have to approach a place as wild and as unique as PNG; with an open mind and a willingness to experience a way of life totally foreign to you. I’ve never known what it feels like to have to fish for my own dinner, plant my own crops, raise my own pigs, or carve my own canoe, and really have my life depend on it. Visiting villages along the Karawari and glimpsing at people living their lives in a way that would surely render me as useless as a screen door on a submarine in half a day was at once both humbling and beautiful. A friendly face at the Kundiman village. I’ll never forget our visit to the Kundiman village, where the Yokim tribespeople greeted us in their finest traditional costumes – the women wore spectacular shell necklaces, colorful grass skirts, and elaborate headdresses decorated with flowers and ferns, while the men donned clay body paint, skirts of banana leaves, and fierce face paint. Men showed us how villagers along the Karawari have harvested the sago palm for centuries – I’m certainly not strong enough to smash sago fibers, and I probably never will be – while the women put on a cooking demonstration, treating us to traditional village fare. Processing sago palm is a labor intensive task, one that local villagers do not take lightly. The kids laughed as our Swain crew sampled sago pancakes, and delighted in sharing with us their river games. We visited another village where we tried our hands at basket weaving; mine was originally supposed to hold live fish, though it’s unlikely I’d have been able to use it to catch a cold. 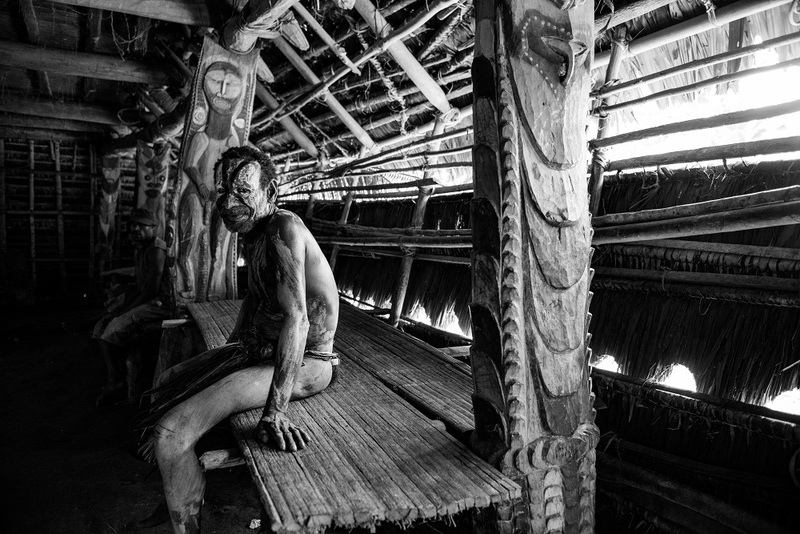 We were treated to local lore inside a spirit house, and sat back in awe as Konmei villagers engaged in a spirit dance. 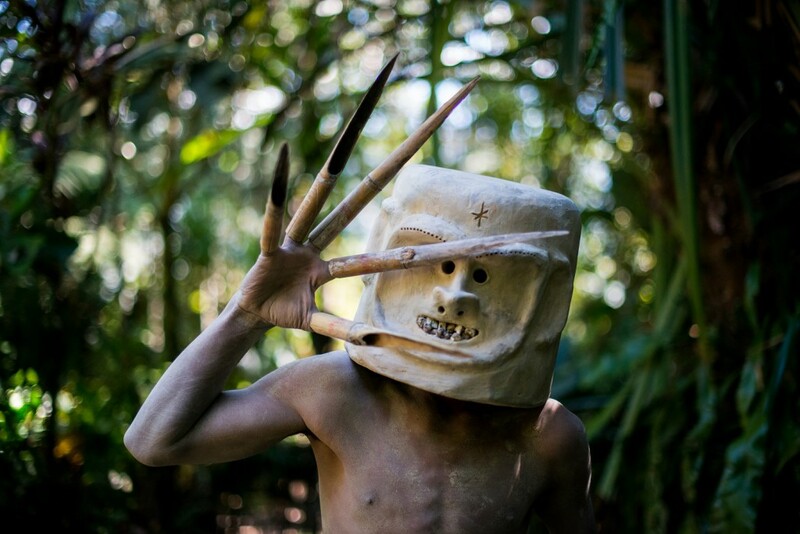 A Konmei villager in traditional costume, preparing for a ceremonial spirit dance. Each village visit was a snapshot in time, and a showcase for a quickly fading aspect of traditional life – and when and where we were asked or given an opportunity to join an activity or speak candidly with local folk, our experience was that much more enriching. A lesson in basket weaving from a young girl. We spent our nights at the beautiful Karawari Lodge, a rustic river outpost outfitted with more amenities than one would expect to find in this very remote part of the world. I treated myself to a South Pacific lager out on the balcony, where I kept watch on the setting sun. When the light burned out dozens of tiny fires came alive in the distance, each signaling the beginning of evenings of song and dance in the villages. I wasn’t worried about WiFi or email anything else but what stories were being exchanged down below me. I knew then that Papua New Guinea had captured my heart, and that I’d someday soon be back for more. 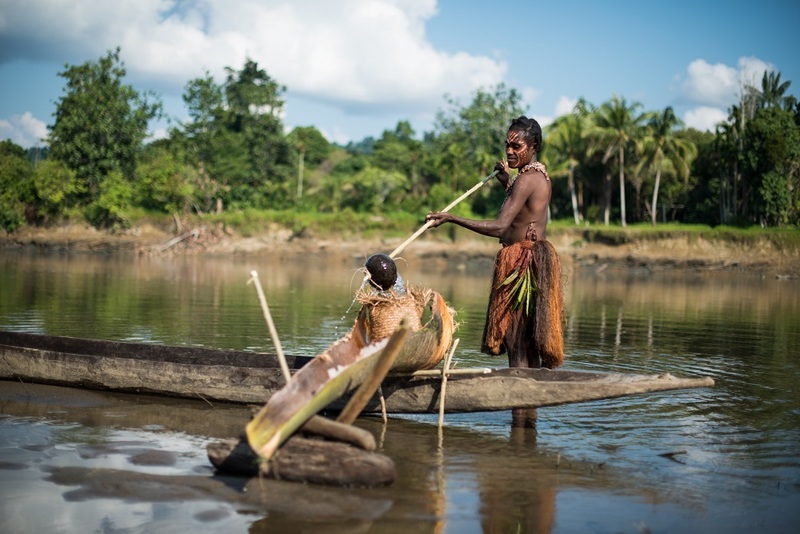 A snapshot of life along the Karawari River. A glimpse inside an ancient men’s house. A question weighed heavy on my mind as my plane circled the landing strip at Mount Hagen, somewhere over the rugged heart of Papua New Guinea, a spellbinding place where the verdant Wahgi Valley is buttressed by the towering spires of the imposing Central Cordillera. How do I live like a local out here? 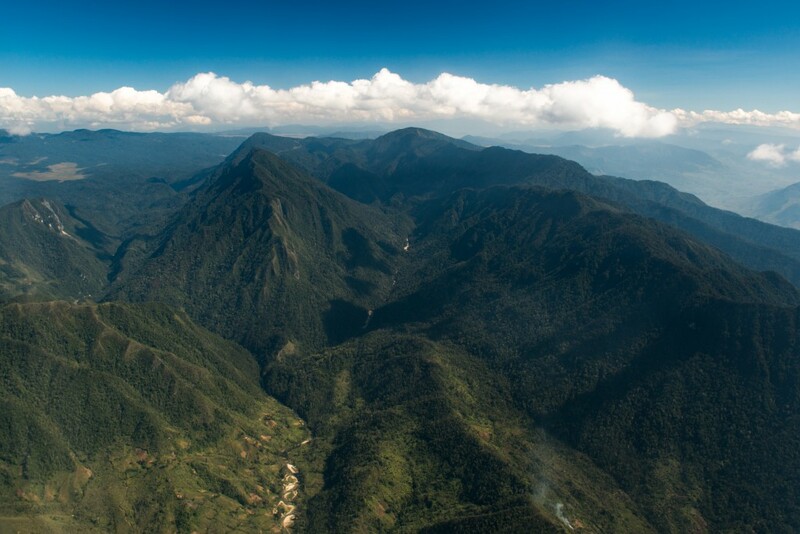 My first glimpse of Papua New Guinea’s rugged Central Highlands. Swain Destinations, USTOA and AFAR sent me halfway around the world to get at the essential nature of the PNG travel experience; to meet local folks here, there, and everywhere; and to discover a remarkable moment or two. But how to do all that in a place as unique as Papua New Guinea? Where to begin? PNG has a reputation for being one of the wildest places on earth – millions of people in the vast interior and out along the coast continue to practice subsistence farming and fishing as they have done for tens of thousands of years; more than 800 languages and dialects flit on air currents from the Bismark to the Coral Sea; while rumors abound of highland people whom have never had contact with the outside world. In fact, the people of Mount Hagen were first introduced –not by their choice, mind you – to the West in 1933. So how would I, as a traveler, reconcile this PNG with the way I live my own life back home on North American soil? Turns out, all I had to do was smile. 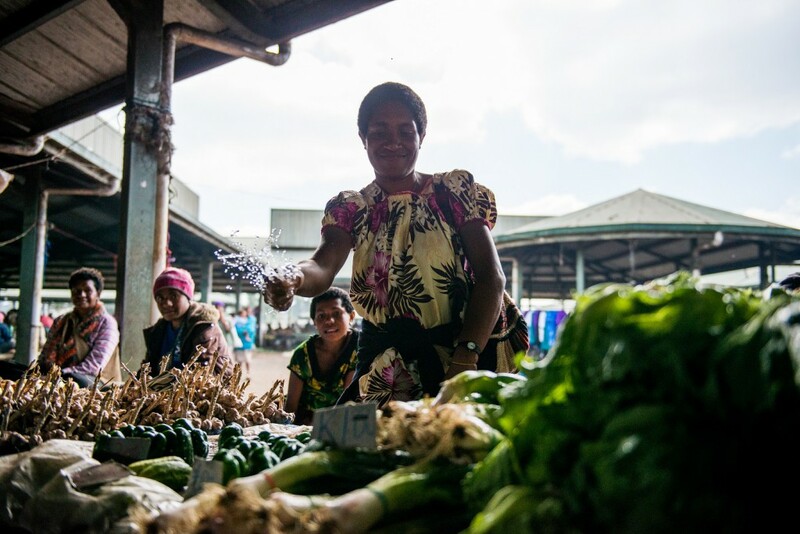 The secret to keeping veggies fresh at Mount Hagen Market. 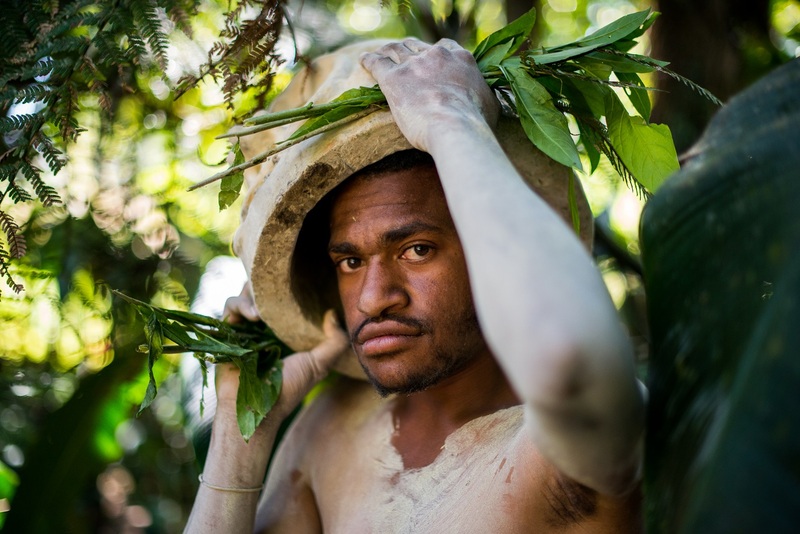 After landing at Mount Hagen, my fellow Swain Destinations travelers and I were carted over to the Mount Hagen Market, a buzzing hive of human (and not-quite-human) activity. I made fast friends with a betel nut vendor’s tree kangaroo, zipped between rows of impossibly colorful fruits with names I couldn’t possibly pronounce, skipped over scurrying chickens, and shook hands with just about every man and woman in attendance. There was electric undercurrent to our visit – our group made up the entire foreign presence at the market that day, and it was certainly no secret that we were there. 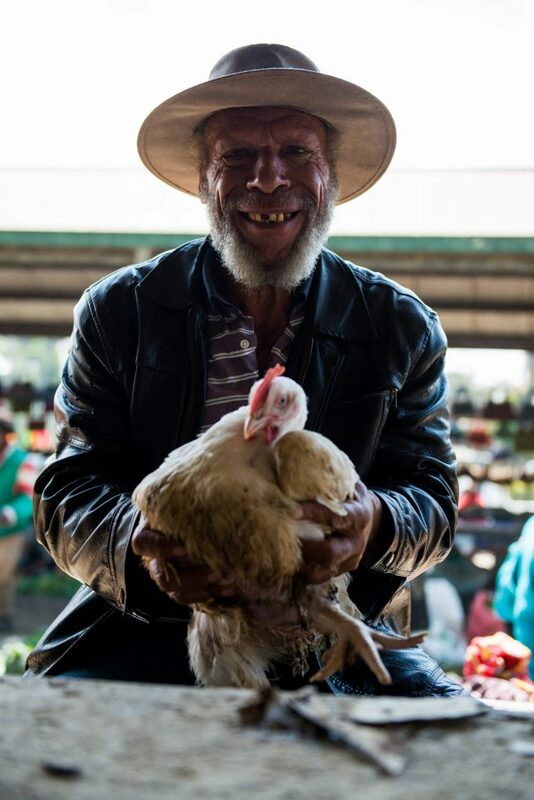 Papua New Guineans are often quick with a smile – and a chicken. Wide-eyed children fell over one another in an effort to get in front of my camera, convivial ladies carved up fruits and veggies and doled out generous samples, and men with steel in their eyes and machetes on their shoulders smiled enormous betel nut smiles when a casual grin was sent in their direction. In this place of vast differences, the one constant – though it was kept concealed at first – was the smile. 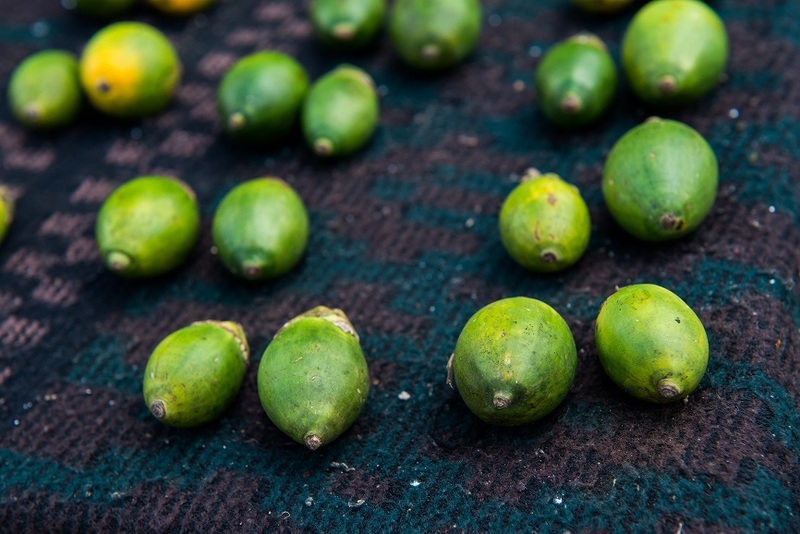 The ubiquitous – and notorious – betel nut. Betel nut is often chewed with lime in Papua New Guinea, and produces a red residue called buai pekpek, a common sight on streets floors everywhere (save for Port Moresby, where the chewing of betel nut is banned). Mount Hagen’s reputation as a lawless frontier keeps some visitors at bay, but nothing during our visit set off alarms. In fact, the local folk we did meet couldn’t have been warmer or more welcoming. Save for the terrifying Asaro Mudmen we encountered in the hills. We followed a winding dirt road into the highlands, out past quaint villages, perfectly manicured fields, and children playing in small mountain streams. We came to a stop opposite what seemed to be impenetrable bush, but our guide led us down an otherwise impossible to find path to the gate for the Pogla Cultural Centre. Upon crossing the threshold, I was struck by what I can only describe as an otherworldly presence; an elderly woman in full highland regalia tended to a small fire, while opaque specters danced in the bush beyond the flames. As if on cue, the sky clouded over, and the Asaro Mudmen came stalking out of the green. These ghastly apparitions wore skirts of grass and leaves, long talons of bamboo on their fingertips, white mud on every inch of their bodies, and imposing helmets of mud, each decorated with what I could only presume were human teeth and animal horns. The Mudmen cut a striking figure against their surroundings; I could only imagine what their true enemies must have thought when the Mudmen set upon them during battle. The Mudmen appear as ghostly appiritions from the woods, ready to strike fear into the hearts of their enemies. Legend holds that a band of peaceful villagers, originally from the village of Goroka in the Eastern Highlands, were waylaid by another tribe and forced to abscond from their traditional homelands. These villages were chased into the Asaro River, where they waited for the cover of night to aid in their escape. But as they rose from the water covered in mud, their enemies thought them evil spirits, and retreated in terror. 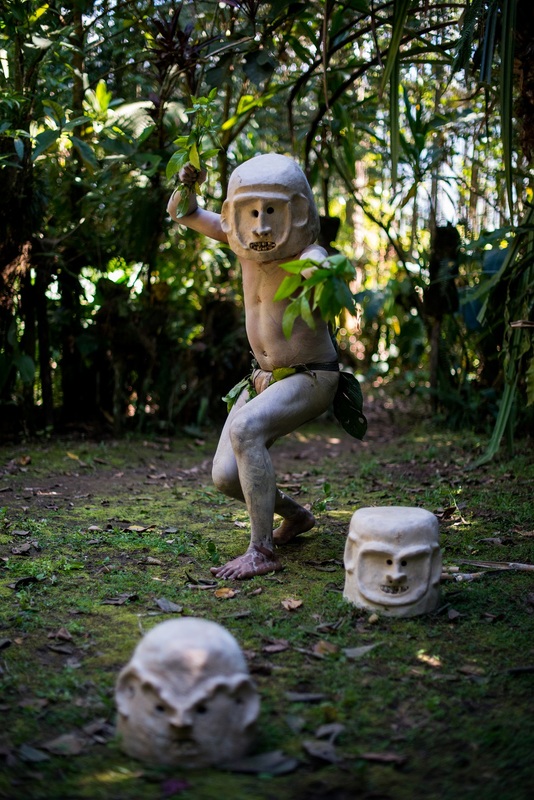 The Asaro Mudmen then began crafting their incredible helmets to use as a deterrent against any would-be invaders. Mudmen make their helmets from river mud and stone, and sometimes decorate them with human teeth, horns, and feathers. The fingers pieces are made from sharpened bamboo. Our group managed to hang in for the entire performance put on by the Mudmen, and were granted an opportunity to peek behind the masks, where huge smiles were hiding. Our Mudmen ranged in age from 9-16, and are part of a family dedicating to preserving an antiquated way of life and scores of highlands traditions. 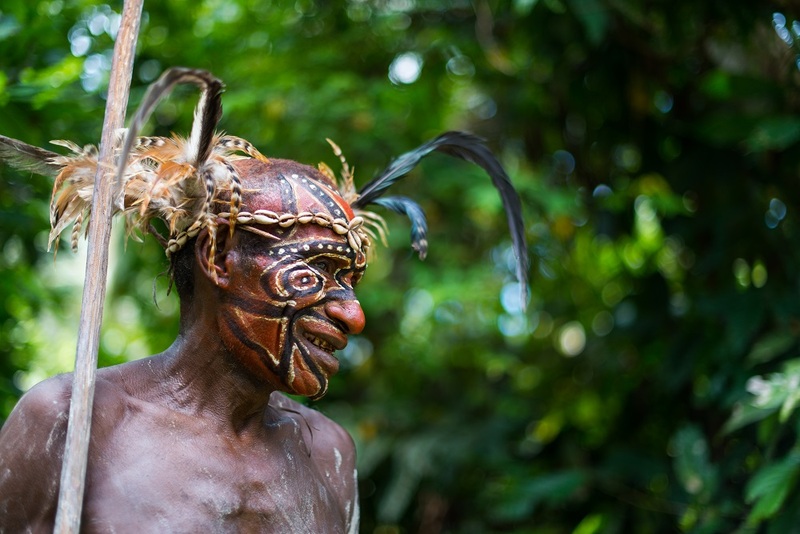 The family’s patriarch shared with us Mudmen lore, and his reasons for why it is important that native highlanders protect their ancient traditions in the face of an ever-modernizing Papua New Guinea. A friendly face appear from under a heavy helmet. My first real glimpse at life in PNG ended with a visit to the beautiful lodge at Rondon Ridge, located at 7,100-feet above sea level on the hipbone of Kum Mountain. I marveled at the mountain views as I contemplated life in the valley below. I think it was in that moment that I realized just how awesome the opportunity before me was – a chance few people on earth have to experience an ancient culture and way of life quickly vanishing from the face of the earth. I decided that if I couldn’t exactly live like a local in my limited time in PNG, I would learn all I could about a very special way of life. The serene surroundings of Rondon Ridge. For highlights of Flash Parker’s tour of Papua New Guinea, click here. “Wiggle, Wiggle, Wiggle, Wiggle!” shouted Lisa Greene, an attorney from Colorado. 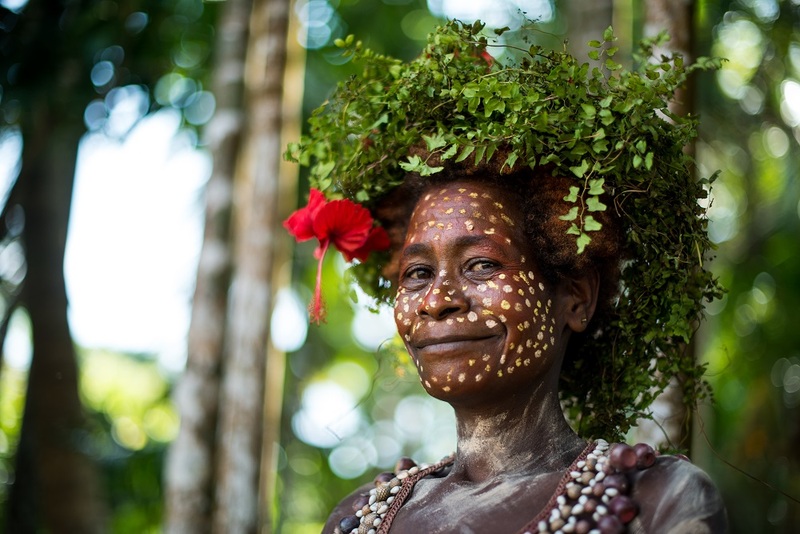 In the middle of the Sepik, one of the most remote regions in the already remote Papua New Guinea, Lisa had captivated the attention of 50 squealing children with her “wiggle.” She was dancing like crazy—moving her hips, throwing her hands up and hopping around on one foot, then the other. We had just arrived by riverboat to this small village and we were greeted by slew of curious onlookers, most of which were children. And then Lisa broke out the “wiggle” and the tribe had no idea hit them. Cries of glee filled the palm tree studded village center. Laughter breaks down barriers. In this moment of pure silliness, we all felt united with the local villagers. I realized, as I giggled along with them, that comedy is the one of those special few common denominators. I also realized that I wouldn’t have experienced this moment if I hadn’t been traveling with this particular group of travelers on our Swain Destinations’ customized itinerary. We met Lisa and Kathy, two college pals and moms from Boulder on a “girls trip,” a few days earlier at one of the Papua New Guinea lodges. Our tour itineraries overlapped and we were able to share part of this journey with them. Exploring this part of the world, rarely seen by travelers, made us all become friends fast – we were fellow explorers sharing in this once in a lifetime experience. Travel to Papua New Guinea requires a few things in all travelers. First of all, you must be eager to learn and understand the culture of the people that you meet along the way. There’s so much natural beauty in this country but the true treasures of this destination are the people. You have to be flexible and have a sense of adventure. This is not the strict itinerary, check-off-the-sites type of trip. To understand this country, you must understand that each day is different. It’s not the easiest place to get too and once you arrive, you might not have all the modern comforts of home (though a digital detox is healthy every once in a while!). Lastly, I highly suggest traveling with a specialized tour operator, such as Swain Destinations. Papua New Guinea is primarily relationship based and you can’t just walk into a village without having a guide prearrange your visit. Just simply getting to and from lodges and activities requires a bit of effort and on a tour, you don’t need to worry about all those logistics. Swain Destinations in particular specializes in customizing your itinerary as well, so you can focus your time on seeing and doing exactly what you want. 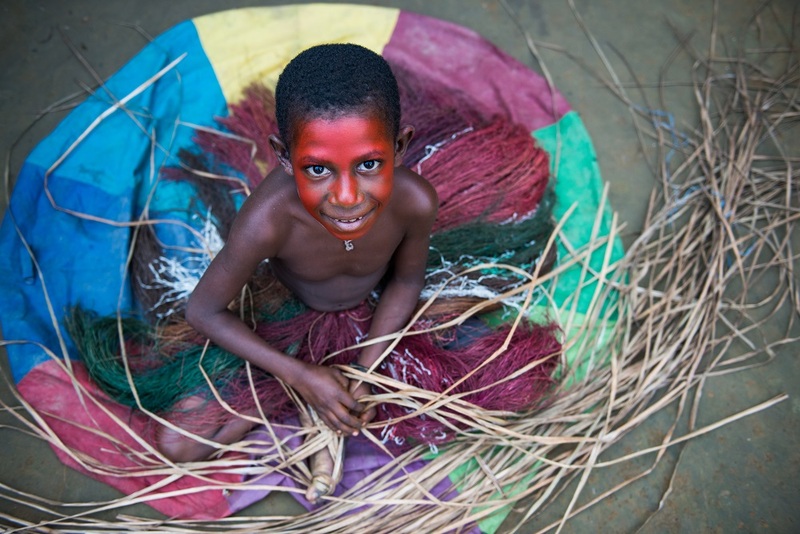 For us, it was meeting as many locals and immersing ourselves as much into the Papua New Guinea culture as possible. Clearly, there’s a kindred spiritedness amongst those who choose this unique destination. That camaraderie is crucial when you want to share the impact of some of these experiences. For instance, I hadn’t expected to bond with a young girl, painted in ceremonial garb as we took selfies with my iPhone or the impact of feeding a confident hornbill, straight out of my hand. It’s those types of moments that are really hard to communicate with friends and family back home. Sometimes you just have to be there. That’s why you can relate with your fellow travelers in a way that can’t be replicated with anyone else. Traveler bonding is more prevalent in Papua New Guinea compared to other destinations and that has a lot to do with time. And Papua New Guinea definitely runs on its own time. The itinerary is made to be flexible as it is wholly dependent on things out of our control, like the weather. However, this gave us time to really connect. Often, even on our travels, we don’t have time to have uninterrupted conversations. We enjoyed extra coffee waiting for the weather to clear for our flight to the lowlands. We played cards in the main lodge when a surprise tropical thunderstorm hit the Karawari. We spent hours watching river life go by as our boat gently cruised between villages. And these calm moments were equally as important as the action packed ones. I was able to reflect on the Papua New Guinea way of life, talk about what we were seeing with the group and have uninterrupted access to the guides. I learned just as much from my fellow travelers as I did from the local villagers and guides. We laughed, shared stories from home, exchanged travel tips and played games. We supported, helped and inspired each other. In each of the three areas that we visited, I found the local PNG people to be so welcoming and excited to have us. Our Swain Destinations tour arranged for local guides to serve as ambassadors, bringing us in the villages, the homes and to the sacred buildings of many local tribes. We danced in Huli Victory Dances, tasted Sago Palm pancakes and listened to the Mud Men storytelling. We toured local markets and watched women fish on the river. We became a part of the daily local life, “wiggle” and all. What makes Papua New Guinea so special, in my opinion is the people you meet. This trip was not only enriched by the local people and local guides, but also the fellow travelers we met along the journey.Papua New Guinea gave me an even deep understanding of what it means to #traveltogether.